Lost Pet Found Pet blog is a place where we can bring you current information on important issues, stories and topics that can help you and your pets. Please read our newest blog. Hiding Behind a Keyboard....Bullies and Stalkers on Social Media. I sat outside the courtroom door in the witness waiting area prepared to testify for a local animal rescue. This rescue, like many others in the South Florida area, was the victim of cyber bullying and stalking by one particular person. The defendant, a fifty-four year old woman. If you had spotted her in the middle of the crowd, you would never suspect her as the callous deranged person who has threatened and affected so many human and animal lives. This is the face of the New Age Cyber Stalker. Naive as I may be, I thought that I had graduated from the world of bullying after High School. Growing up, we were able to confront our nemesis face to face, if we had the courage to do so. Who would have thought decades later the internet and social media would manifest the angst of hurt, weak people that now hide behind a keyboard. People who destroy the object of their ire as if they were playing a video game with the destructive urge to win. So many people have tried to analyze the motivation behind the Cyber Bully/Stalker. Many theorize that they lack self worth, in the past they were victims of bullying and are now seeking revenge, they are mentally challenged and the list goes on an on. Guess what...I DON'T CARE! I don't have the time or the interest in analyzing motives. There is no excuse. Adults acting in this child like manner? At least children are now learning in school on how to deal with Cyber Bullying and Stalking. Many Cyber Bullies and Stalkers hide behind "troll" accounts. They think the coward act of hiding behind a false name or user handle will absolve them of their actions. Bullies such as the animal rescue Cyber Stalker assume multiple troll accounts. These people are to blame for their actions but I wonder, how much blame and responsibility falls on the Social Media platforms such as Twitter and Facebook? Do Jack Dorsey and Mark Zuckerberg embrace the use of multiple accounts by these users to boost Twitter and Facebook subscriber counts each month? After all, "user growth" is a key component to their Wall Street reports every quarter. Are these troll accounts even monitored or factored into their reports? The first defense of on-line bully behavior is, "I have a right to freedom of speech!" Let's clarify this immediately...there are LIMITATIONS to freedom of speech. Libel, Slander, Copyright Violation, Right to Privacy, Incitement and Public Nuisance to name a few. There are consequences that go with your actions when you decide to metamorphosis into Trump like bully brashness to suppress the voice of others. Can you really afford to take the risk? Unfortunately, I became a victim of cyber bullying and stalking. I befriended a woman who in the past year has had a very hard time. 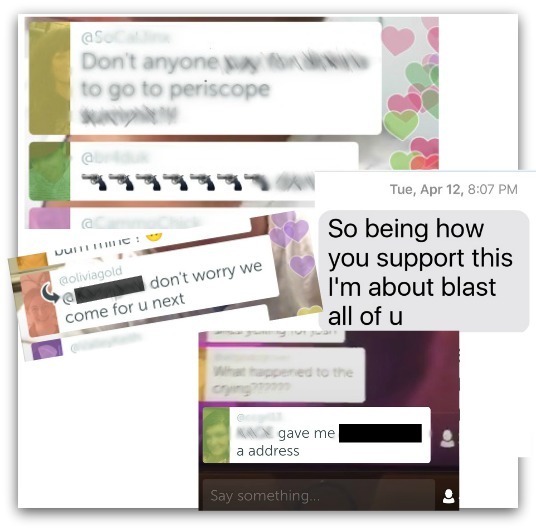 She began to broadcast her life on Periscope. She is pretty, witty and entertaining. She almost immediately grew a large fan base with her make-up scopes and fun antics. As time went on, she also broadcast some of her darkest moments. Many times these moments were hard to watch and it attracted mean spirited people. They began to dig into her past and humiliate her. I chose to support her and offline tried to guide her to seek help. Her "friends" began to "jump ship" and became her worst enemies. Supposedly some believed they could bully her into hitting rock bottom. They said they wanted to see her live on the streets, thinking this was the correct solution for her to finally get the help they thought she needed. In reality they had no interest in helping her, they wanted power over her so they could direct their own sick soap opera for their entertainment. Knowing her past and current struggles, she was already punished every day of her life. Anyone truly wanting to help her would know that threatening, stalking and bullying was not the answer. She needed encouragement. I chose to continue to support her and hopefully help to guide her to a better place. Because of this, I too became a target. Imagine that...kindness made me a target. I was falsely accused of being her "enabler." Some people went so far as to create impostor accounts with my full name and personal information. This is a third degree felony and is punishable with up to 5 years in jail. I immediately closed my account, an account that I used to broadcast live animal rescues and adoption events. I had read that the first thing to do when dealing with Cyber Bullies and stalkers is to cease all contact with them. Next, I filed a police report. My case was escalated to a detective. I was very happy to find out that there are no ghosts behind a keyboard. Bullies and stalkers can be tracked and we can bring them to life. Email address associated with account? Is there any other information submitted with opening account? This particular case is pending and I anxiously await to bring these offenders out in the open to face the repercussions of their actions. "There are many good rescues that do fantastic work but there are just as many SCAMS out there preying on innocent peoples emotions and money. I decided to go out with some of these rescues & video the truth. I wanted to verify for myself & my fans that these situations were real before we donated. I progressed to producing videos to help animals find their forever homes." Our concerns are somewhat the same but the way we choose to approach our concerns are worlds apart. Each day we are overwhelmed with information coming to us from every angle. Ultimately, it is our own responsibility to decipher this information and verify the truth. If there is something that bothers you, that you think is wrong, don't immediately believe what you read and then bash it. Verify it. Go to the source, offer a solution, don't become part of the problem. Many times people will criticize others to feel better about themselves. That is the easy way out. IT IS YOUR ACTIONS THAT MATTER.